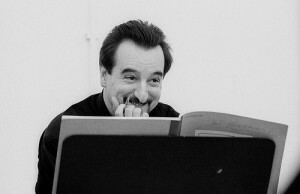 Composer Fabio Nieder was born in Trieste; he now lives in Germany. He studied chamber music with Dario de Rosa and Libero Lana, composition with Giulio Viozzi and piano with Roberto Repini at the Conservatorio Giuseppe Tartini in Trieste from 1973–81 and studied privately with Witold Lutoslawski in Groznjan, Croatia in 1977, on a scholarship from Jeunesses Musicales. Among his honours are Primo Premio in the competition Valentino Bucchi in Rome (1979), the ISCM Prize in Austria (1980), three prizes in the competition of the Internationale Gaudeamus Muziekweek in Amsterdam (1980, 1982, 1984), Primo Premio in the competition 2 Agosto in Bologna (1995), Secondo Premio in the competition Ennio Porrino in Cagliari (1995), Sonderpreis in the competition Compania in Münster, Germany (1996), the Gustav Mahler Kompositionspreis in Klagenfurt am Wörthersee (1998), and Primo Premio in the competition Domenico Guaccero in Bari (1998). His music has been performed in Algeria, Austria, France, Germany, Iceland, Italy, the Netherlands, South Korea, Spain, Switzerland, the UK, and the USA. As a pianist, he served as an accompanist to Petre Munteanu and Dame Elisabeth Schwarzkopf from 1978–81 and later served as an accompanist to Barbara Hannigan, Alfredo Kraus and other singers. In addition, he has worked as a conductor, most often with the Nieuw Ensemble in Amsterdam, and has organised various ensembles for contemporary music in Germany and Italy. He taught analysis at the Università degli Studi in Trieste and has taught at the Conservatorium van Amsterdam since 2005. He has given lectures in Austria, Estonia, Germany, Italy, and Slovenia. His primary publisher is Casa Ricordi.